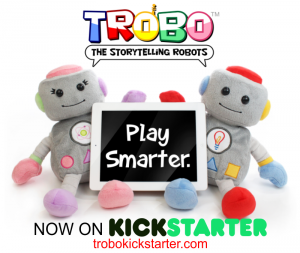 ORLANDO, Fla. – It’s a big month for TROBO the Storytelling Robot as the company launches its Kickstarter campaign and participates in both the ABC Kids Expo in Las Vegas and Maker Faire Orlando. Created by two dads, Jeremy Scheinberg and Chris Harden, TROBO is a huggable stuffed robot toy and storytelling app that answers kids’ questions about the science and engineering around them. The plush storytelling robot, TROBO, uses an interactive storytelling app to read out loud and engage children ages 2-7 through an iPad. They currently have 2 characters…a male TROBO, Edison and a female TROBO, Curie. TROBO’s Kickstarter campaign launched on Wednesday, September 3rd and raised 1/3 of their $60,000 goal in the first 24 hours. The campaign will fund the first round of manufacturing and complete development of the storytelling application. 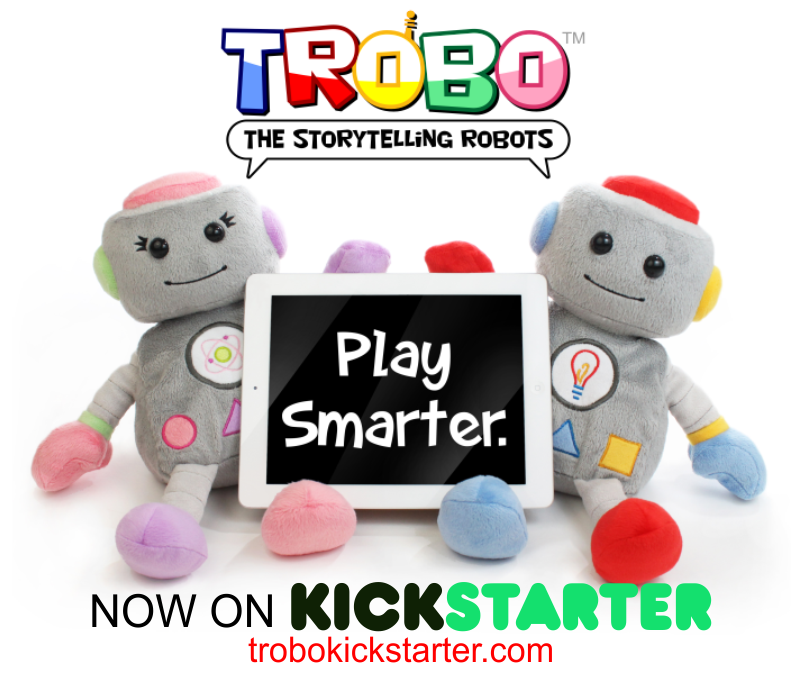 The campaign – which is accessible at www.TROBOkickstarter.com – aims to appeal to parents and grandparents looking for smarter toys for children. The company will also be appearing at the ABC Kids’ Expo September 7-10 at the Las Vegas Convention Center where they were accepted into the show’s “Invention Connection” pavilion for innovative juvenile product startups. “We are really excited to meet with toy buyers from all over the world to get more feedback which will help us bring TROBO to market,” said Scheinberg. TROBO will be exhibiting at the show at booth #35 in the Invention Connection. Rounding out a busy few weeks, the company will also be exhibiting at Maker Faire Orlando at the Orlando Science Center September 13-14. “We have had such great support from the Orlando community since we created TROBO. It will be great to show our product to people who have followed us since the beginning,” said Harden. So how do two Central Florida fathers invent and prototype this amazing technology toy? Scheinberg and Harden both have backgrounds in engineering and storytelling. Jeremy Scheinberg was the Chief Operating Officer at Alcorn McBride, the leading manufacturer of audio, video and control products for themed entertainment with clients including NBC, Universal, Lego and Disney. Chris Harden was a Development Director with EA Sports, managing the User Experience core technology group for the label and has a history in film and comics. Dieser Eintrag wurde veröffentlicht in Development, Education & Studies, English, General und verschlagwortet mit crowdfunding, HereComesTrobo, Kickstarter, Robot, storytelling von Sebastian Trella. Permanenter Link zum Eintrag.